See images above. 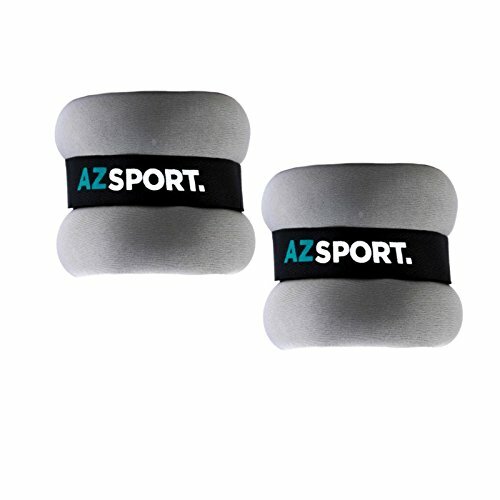 Achieve optimal benefits from your workouts with the new AZSPORT Adjustable Ankle and Wrist Weights. These superior quality weights weighs 3 pounds each and are great for any sports training including aquatic exercise, jogging, walking, aerobics, and gymnastics to increase core balance, flexibility and body contouring. This weights feature a cushioned, moisture absorbent, and non-abrasive neoprene material with adjustable Velcro strap for reliable and comfortable fit for both men and women. Get yours today! INCREASE AND BOOST ENDURANCE. Intensify effects of your daily training for better stamina with this ankle and wrist weights. It measures 3 lbs each and supports strengthening of endurance even with the simplest exercises. TONE LEGS AND ARMS WHILE BURNING CALORIES. Adding sufficient weight while in action stimulates muscles to enhance strength, burn more calories and improve bone density. With its simple design, you can accelerate firming your upper and lower body easily any time of the day. IMPROVE EXERCISE VERSATILITY. Add challenge to your daily workout with this weightlifting cuffs. This clever tool provides a convenient way to add extra resistance to basic exercises. DURABLE AND COMFORTABLE. Made from top rate neoprene fabric that secures skin comfort, moisture absorption and heavy duty performance. Well-constructed design for equal load distribution with an adjustable Velcro strap for a cozy fit around your ankles and wrists. MONEY BACK GUARANTEE. Take no risk with our satisfaction guarantee. Love this or get full purchase price refund only from AZSPORT. Order yours now! If you have any questions about this product by AZSPORT., contact us by completing and submitting the form below. If you are looking for a specif part number, please include it with your message.